This is a studio photograph of Josephine Braham Johnson, who was born June 18, 1838, near Gallatin, Tennessee. 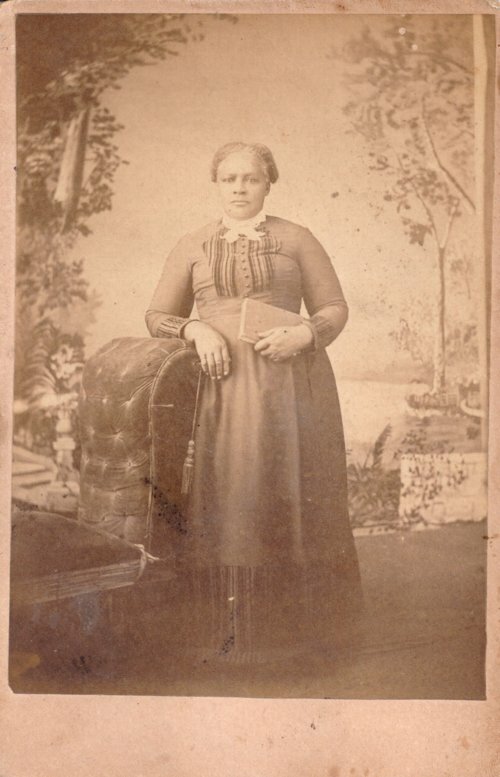 She was one of 13 children born to Harriet Braham, a slave. When Josephine was 13, she married Columbus Johnson, and they had their first child a year later. After they gained their freedom, the Johnson's bought a home in Gallatin. Later they purchased and built homes in Topeka and Dunlap, Kansas. In Dunlap, she had a boarding house and sold vegetables, chickens, eggs, milk, and butter. She died on April 6, 1910.